As a boy, Alan Alda suffered through polio, developing his sense of humor while bedridden, watching his eccentric family's antics. As a young man he started in comedy with Chicago's Second City troupe, and his first big break came with the Americanized version of the British skit show That Was the Week That Was, in 1964, with David Frost and Buck Henry. During his stint in the Army, shortly after the Korean war, Alda served as a gunnery officer in Korea. M*A*S*H, of course, was set during the Korean war. 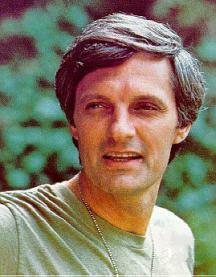 As Dr Hawkeye Pierce on M*A*S*H, Alda brought the series a perfect balance of wiseass and gravitas. As the series continued its long run, Alda gained more power behind the scenes, and some critics complained that the series delivered more political statements than laughs in its latter seasons. Over its eleven seasons, M*A*S*H earned numerous Emmy awards, and Alda earned five -- three for acting, one for writing, and one for directing. He is the only artist to win Emmys in all three of these categories. He wrote 20 and directed 32 episodes of M*A*S*H.
Alda has written or directed five feature films, of which the best reviewed was The Seduction of Joe Tynan with Meryl Streep. Playing perfectly off his M*A*S*H role, Alda played a self-obsessed and none-too-funny TV sitcom star in Woody Allen's Crimes and Misdemeanors. He was the longtime host of Scientific American Frontiers on PBS, and in the last season of TV's The West Wing, Alda played a moderate Republican running for President. He has written a comedy-tinged autobiography, Never Have Your Dog Stuffed. The stage name "Alda" is a contraction of both Robert and Alan Alda's real first and last names, Alphonso D'Abruzzo. Alda's wife Arlene played clarinet for the Houston Symphony, and later became a successful photographer. They have raised three daughters, which has made Alda into a staunch feminist.